Let’s say you didn’t know anything about this person except for the below photograph and the fact that she occupies a high position in the U.S. government. What would you intuit about her character based on her face? I’d say that she’s obviously corrupt, a conscienceless liar filled with contempt for the truth, and, even if not literally a criminal in the sense of a person violating criminal statutes, a political criminal in the sense of a person seeking to harm her society. Given a choice, and understanding that this administration will be actively working against my interests, I would prefer that it be staffed with as many incompetent, discredited people as possible. 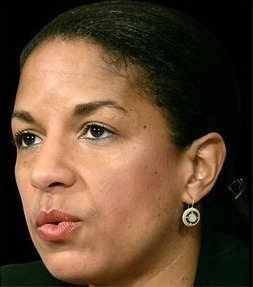 On the bright side, the alienation that American conservatives feel toward their government can only deepen with the continued presence of people like Susan Rice, Eric Holder, and Barack Obama at the helm. Unfortunately, given the left’s dominant position in our society, the process of becoming politically alienated from America has become a necessary but painful step for traditionalist conservatives if their culture is to survive.